What is a coj confession of judgement? 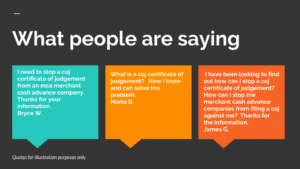 A coj confession of judgement or certificate of judgement is a legal document lenders can use to take quick and easy legal action against their customer. If you want funding without a COJ, apply below now. Get a loan without a coj. When the merchant cash advance company declares a default, a completed coj certificate of judgement allows mca companies to easily take legal action against a merchant. This usually happens without traditional court proceedings or a trial. The merchant has already providing a notarized signature authorizing the merchant cash advance company to get a default judgement or summary default judgement against them. Get a mca merchant cash advance or business loan with no coj certificate of judgment. 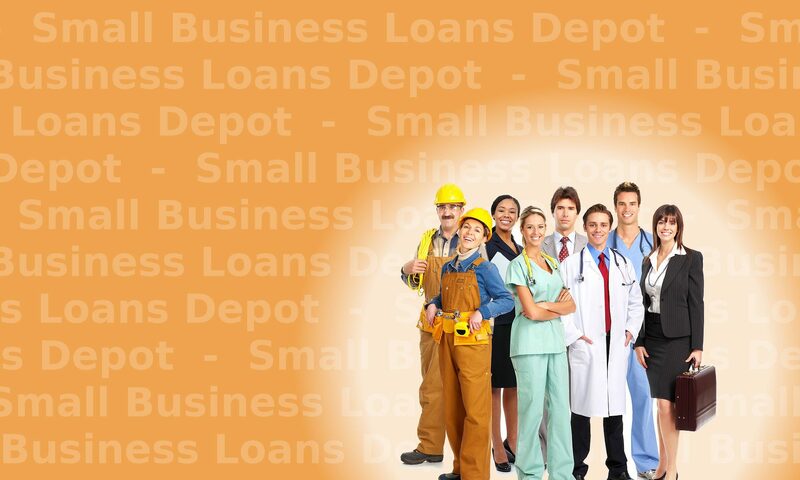 We have business loan programs that do not require a coj, including large business loans to get out of your cash advances, bank statement loans, loans against equipment, asset based loans and other options such as paying off your mca merchant cash advances. Apply now, above to get all of the options available to you. What is a coj certificate of judgement? I need to stop a coj. F.A.Q.’s frequently asked questions and comments. Different ways to stop a coj, get out of a coj and deal with a coj certificate of judgement. How can I stop a coj certificate of judgement? I need to get out of a coj certificate of judgement proceeding. If you feel a lender is about to take action against you, you can do the following to try to stop it. Contact the lender to try to come to a last minute agreement on a repayment plan, payment arrangement, settlement, or any type of agreement. Continue to actively communicate with the mca merchant advance company. When the merchant does not communicate with the funder or lender, such as avoiding calls and not reply to correspondences, the merchant cash company takes the strongest action. Callers ask, “will they freeze my account?”. If you do not communicate with the mca company they may block your business checking account. Keep paying the daily payments if possible while you work towards a solution. When the merchant stops payment on their daily advance causing the daily merchant cash advance payment to not be paid and rejected, the mca merchant cash advance company may declare a default. Keep the business checking account from which the daily payment is drawn open. Anytime the merchant closes their business checking account and the daily merchant cash advance payment bounces and is rejected, the mca merchant cash company can declare it an immediate default. Stay visible, open and available. Sometimes a merchant disappears or if you go out of business, it shows the mca merchant cash advance company that you are still trying to work with them and reduce their losses. They may still decide to negotiate with you and agree to a workout solution. A coj confession of judgement is a document that a lender may ask for as part of a financial transaction. The mca merchant cash advance company or any lender or party holding a coj can file the document in court and obtain a judgement against you and your business immediately without a jury trial or bench trial. The mca merchant cash advance company can then use the judgement to immediately go to any bank you have money with and demand the bank turn over the money to the lender. In general the banks must comply with a judgement order by a court. In the document you acknowledge guilt in the event of a default as described and declared by the lender. Question: How do I stop a coj? Answer:There are ways to stop a coj if you have defaulted on an mca. Maybe the best way is to contact the cash advance company immediately and come to a workout or settlement solution. You may be able to agree to a repayment plan or settlement and repayment plan that prevents the mca company from filing the coj confession of judgement. Question: What will an mca company do with a coj? 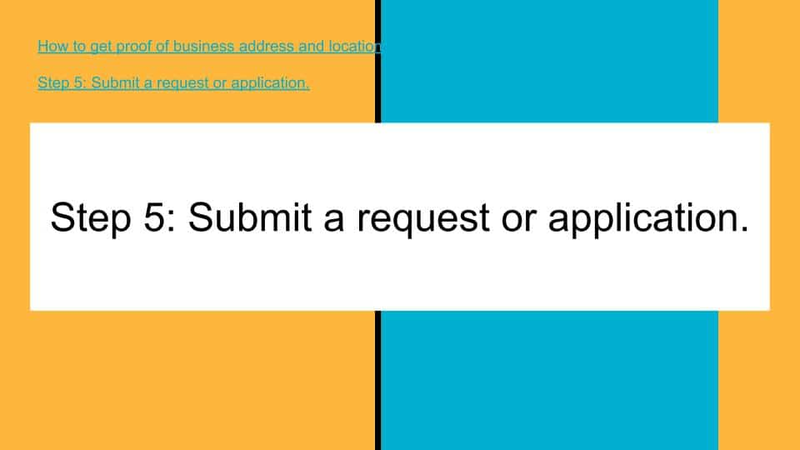 Answer: It depends on the mca company you are dealing with and also how well you are communicating with the mca lender and how much sincere effort your business is making to try to resolve the default or reach a settlement. Most funders normally do not take court action with the coj confession of judgement unless the customer disappears or intentionally and actively does not communicate. Question: What can an mca merchant cash advance company do to me with a coj confession of judgement? Answer: The mca cash advance company can get a court to automatically request and receive a default judgement. They may be able to get it the same day. Once the cash advance company gets a default judgement they can contact your bank and have available funds debited to pay towards the amount of the default judgement. Read the coj closely. Understand clearly under what circumstances the coj confession of judgement allows the lender to take court action against your business. Question: Can the merchant cash advance company shut down my business and my doors? Question: How can I get a mca merchant cash advance or business loan without a coj confession of judgement? Answer: There are several business loan options that do not require coj confession of judgement. Contact us to review your choices. Question: How can I protect myself against a coj? Answer: The best way is to pay the daily or weekly advance payments as agreed. Other ways are to get a business loan or merchant cash advance that does not require a coj confession of Judgement. Ask a Lender if it is required when you first apply. Question: I signed a coj confession of judgement. Can I cancel a coj? Answer: You cannot cancel a coj. Call the lender to see if you can still work out a repayment solution. If you truly cannot pay a cash advance consider contacting an attorney to represent any legitimate rights or rationale to avoid your account being overdrawn or shut down. Contact your bank and ask them if you can prevent them from acting on a court order to debit your account or if there are other ways the bank may be aware of to delay a court order or stay a court order. If your business is behind on a merchant cash advance, try to work with the lenders as much as possible on a workout solution. When you work with the lenders as much as possible, their tendency is much more to not exercise a COJ Confession of Judgement. Question: Can an attorney to take court action to get me out of a COJ Confession of Judgement? Question: I am not signing a COJ Confession of Judgement. Can I refuse to sign a COJ? Answer:You do not have to and can refuse to sign a coj confession of judgement. In almost all cases the lender will pull the approval in response. You will then have to start over and look for a lending program that does not require a coj. We can assist with multiple business funding programs that do not require a COJ. Question: How do I know the lender won’t take action against me at anytime once they have a COJ Confession of Judgement? Answer: Nothing is guaranteed. If you have not defaulted then action on the lender’s part would be very unusual and not expected. Question: How do I get out of a coj confession of judgement court proceeding? Answer: If a court date has been set your options are very limited. One option is last minute final negotiations with the merchant cash advance company. In this situation your business will have to make a very good offer to the merchant advance company in order for them to settle with you. One method is to advise or certify to the merchant advance company that you and your business do not have bank account funds and other assets to seize. If the mca company is made aware by you or your attorney that they will not end up getting any funds by seizing your bank accounts then they may still be willing to negotiate a late settlement. What is a COJ Confession of Judgement? Get business loans without a COJ Confession of Judgement. What can a lender do with a COJ Confession of Judgement?